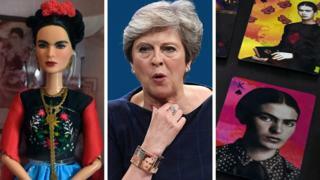 In recent months, Frida Kahlo has been turned into a Barbie doll, been featured on a bracelet worn by UK Prime Minister Theresa May, and has made a cameo appearance in Oscar-winning animation Coco. Besides that, she’s seen on T-shirts, murals, jewellery and shoes, with the iconography threatening to overshadow her actual art. Much feels familiar about Kahlo – there’s the braided and flowered hair, her direct gaze under that unibrow, the distinctive outfits she wore, and of course her artworks. So much so that she feels – and looks – like she belongs in 2018. Why does her image and her attitude still feel so fresh, more than 110 years after she was born, and almost 65 years after she died? “She was ahead of her time. The reason she’s so contemporary now is that she was contemporary then,” says co-curator Circe Henestrosa. Kahlo resonates for many reasons in the modern world, she says. “It has to do with what she represents today. Whether you’re a woman, whether you’re disabled, suffering from some illness, suffering from a romantic break-up – it connects on so many levels. “She was a Mexican woman, with dark skin, who was disabled and looking for a place as a female artist in a male-dominated environment in Mexico, in the world of art. Now, for the first time outside Mexico, her personal effects – which were sealed in her bathroom for 50 years after her death and only revealed in 2004 – have been gathered alongside her artwork. The V&A Museum in London is putting 270 pieces from Casa Azul – the Blue House, where Kahlo was born, lived and died – on show in an exhibition titled Frida Kahlo: Making Her Self Up. 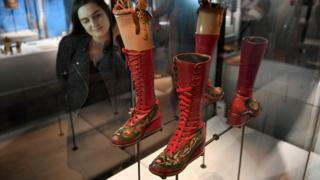 There’s the prosthetic leg, complete with red ankle boot, which she wore after an amputation following years of chronic health problems – she had polio as a child, and then a near-fatal road accident when she was 18, which caused her a lifetime of pain. We see too the necklace Kahlo made of burial beads, the jade that had been buried with Mayan dead centuries previously, now experienced in double – both in a display case, flecked with paint from when Kahlo wore them, and in a self-portrait on a nearby wall. But then, more prosaically, there’s the large pot of Pond’s Dry Skin Cream, the empty bottles of perfume, and even the Revlon eyebrow pencil she used. “This is the nearest we will ever get to meeting her,” says Henestrosa. “It’s the nearest we’ll ever be to her. We meet her intimately for the first time. “I think it’s very different to other exhibitions where you just see her paintings. “We find the woman who was very sophisticated, loved perfume and make-up, was incredibly feminine and loved to dress up. Through her art and her dress, she dealt with her political beliefs, her relationship with [her husband] Diego Rivera, her disabilities. Henestrosa says Kahlo “defined herself on her own terms”, which is something that resonates with people today. 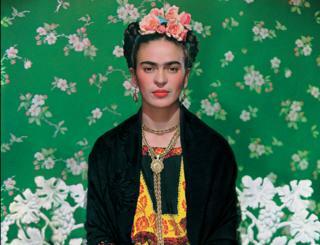 Instead of seeing Kahlo as a victim, people are now celebrating her unconventionality. “She suffered – but she also drank tequila, had lovers, dressed up and had a lot of fun. 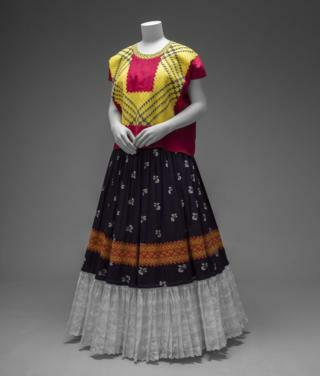 Asked what she thinks makes Kahlo so well-loved today, co-curator Claire Wilcox, the V&A’s senior curator of fashion, says: “For everyone who comes here, it will have its own significance for them. “She was so photographed in her lifetime, as much as a celebrity would be. She was stopped in the street in San Francisco. Her appearance was so flamboyant. She attracted attention. What did surprise Wilcox in her research were some of the details about Kahlo’s life – the fact that her and Rivera’s initials were sewn into their bed linen and that her clothing had flecks of paint on them, as did the jade necklace that appeared in a painting, as if Kahlo had been attempting to match the exact shade of green. 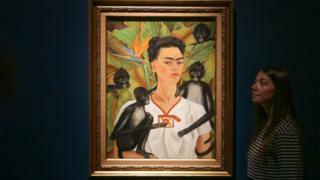 She adds: “My hope is that people will come away with an understanding of who Frida was. 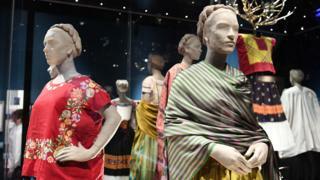 Frida Kahlo: Making Her Self Up is at the Victoria and Albert Museum from 16 June to 14 November.